TODAYS TOPIC IS WINTER PRECIPITATION TYPES. SNOW -- SNOW FORMS IN THE CLOUDS AND REMAINS AS SNOW ALL THE WAY TO THE GROUND. IT MOST COMMONLY TAKES THE FORM OF SNOWFLAKES... WHICH ARE THE FAMILIAR SIX-SIDED ICE CRYSTALS. IT MAY ALSO FALL IN THE FORM OF SNOW PELLETS OR SNOW GRAINS. SNOW FLURRIES ARE MOST COMMONLY SEEN AS A FEW SNOWFLAKES FALLING... ALTHOUGH VISIBILITIES CAN BE REDUCED AT TIMES. IN THE MID SOUTH... THE TERM SNOW FLURRIES IS USED TO INDICATE THAT NO ACCUMULATION IS EXPECTED. SNOW SHOWERS IS A TERM NOT OFTEN USED IN THE MID SOUTH. IN THIS TYPE OF PRECIPITATION... THE SNOW FALLS AT VARYING INTENSITIES OVER BRIEF PERIODS OF TIME. ACCUMULATION MAY OCCUR... ESPECIALLY DURING MODERATE TO HEAVY SNOW SHOWERS. BLOWING SNOW MOST COMMONLY REFERS TO SNOW THAT IS ALREADY ON THE GROUND AND IS LIFTED INTO THE AIR BY THE WIND. IN THE MID SOUTH... HEAVIER SNOWS MOST COMMONLY OCCUR WHEN COLD AIR IS ALREADY IN PLACE OVER THE REGION AND A STRONG UPPER LEVEL LOW PRESSURE SYSTEM MOVES OUT OF THE SOUTHWESTERN UNITED STATES. THE LOW SERVES TO PULL MOIST AIR NORTHWARD INTO THE COLD AIR. LIGHT SNOW OR SNOW FLURRIES CAN ALSO OCCUR IN THE COLD AIR THAT FOLLOWS THE PASSAGE OF AN ARCTIC COLD FRONT. SLEET - SLEET CONSISTS OF PELLETS OF ICE. IN FACT... FOR PEOPLE WHO HAVE TROUBLE WITH THE DIFFERENCE BETWEEN SLEET AND FREEZING RAIN... IT MAY BE EASIER TO ASSOCIATE SLEET WITH ITS TECHNICAL NAME... WHICH IS ICE PELLETS. FOR SLEET TO FORM...SNOW BEGINS FALLING FROM THE CLOUDS BUT THEN GOES THROUGH A LAYER OF ABOVE-FREEZING AIR THOUSANDS OF FEET ABOVE THE GROUND. THIS CAUSES THE SNOW TO CHANGE TO RAIN. THEN... THE RAIN GOES THROUGH A LAYER OF BELOW-FREEZING AIR... USUALLY AT LEAST TWO TO THREE THOUSAND FEET THICK... AND THE PRECIPITATION TURNS INTO PELLETS OF ICE. SLEET TYPICALLY OCCURS IN A FAIRLY NARROW BAND. THIS BAND USUALLY MOVES... BUT AT TIMES MAY REMAIN NEARLY STATIONARY... RESULTING IN ACCUMULATIONS OF SLEET. IN THE MID SOUTH... SLEET MOST COMMONLY OCCURS IN A NARROW BAND BETWEEN AN AREA OF RAIN TO THE SOUTH AND AN AREA OF SNOW TO THE NORTH. FREEZING RAIN -- THIS WEATHER PHENOMENON IS SOMETIMES CALLED GLAZE... BECAUSE OF THE GLAZE OF ICE IT PUTS ON SURFACES AT THE GROUND. FREEZING RAIN MOST COMMONLY OCCURS WHEN PRECIPITATION FALLS FROM THE CLOUDS AS SNOW... THEN GOES THROUGH AN ABOVE-FREEZING LAYER... WHICH TURNS THE PRECIPITATION TO RAIN. THEN... THE RAIN REACHES THE GROUND WHERE TEMPERATURES ARE BELOW FREEZING. THE RAIN THEN FREEZES AS IT HITS EXPOSED OBJECTS. IN THE WORST CASES... EVERYTHING BECOMES COATED WITH A LAYER OF ICE. IN THE MID SOUTH... FREEZING RAIN COMMONLY OCCURS AS AN ARCTIC HIGH PRESSURE SYSTEM BEGINS TO MOVE AWAY FROM THE STATE. IN THIS SITUATION... COLD AIR IS STILL LINGERING AT THE GROUND... BUT WARMER SOUTHERLY WINDS FROM THE GULF OF MEXICO BEGIN BRINGING MOISTURE BACK OVER THE TOP OF THE COLD AIR. SINCE THE AIR AT THE GROUND HAS NOT WARMED ABOVE FREEZING... THE RAIN THAT FALLS FREEZES ON THE GROUND AND OTHER OBJECTS. FREEZING RAIN... AND ITS COUSIN FREEZING DRIZZLE... OFTEN DEVELOP DURING THE LATE NIGHT HOURS... CREATING ICY CONDITIONS FOR MORNING RUSH HOUR. FREEZING FOG -- WHILE THIS IS NOT PRECIPITATION FALLING FROM THE CLOUDS... IT IS ANOTHER WINTER WEATHER HAZARD. FREEZING FOG TYPICALLY DEVELOPS ON CLEAR... CALM NIGHTS WHEN TEMPERATURES ARE BELOW FREEZING. FOG FORMS AND FREEZES... USUALLY ON BRIDGES... OVERPASSES... AND OTHER ELEVATED ROADWAYS. IT CAN CREATE QUITE A SURPRISE FOR MOTORISTS... DUE TO THE PRESENCE OF CLEAR SKIES OVERHEAD. FROST -- FROST DESCRIBES THE FORMATION OF THIN ICE CRYSTALS ON THE GROUND OR OTHER SURFACES IN THE FORM OF SCALES... NEEDLES... FEATHERS... OR FANS. FROST FORMS WHEN WATER VAPOR IN THE AIR TURNS DIRECTLY TO ICE CRYSTALS ON AN OBJECT. THE TEMPERATURE OF THE OBJECT MUST BE BELOW FREEZING FOR FROST TO OCCUR. HOWEVER... FROST IS SOMETIMES SEEN ON THE GROUND WHEN OFFICIAL TEMPERATURES ARE REPORTED TO BE ABOVE FREEZING. THIS IS BECAUSE THE OFFICIAL TEMPERATURE IS TAKEN ABOUT FIVE FEET ABOVE THE GROUND... WHERE THE AIR CAN BE A FEW DEGREES WARMER THAN THE TEMPERATURE AT GROUND LEVEL. TODAY WE WILL FOCUS ON WINTER WEATHER TRAVEL TIPS AND SAFETY RULES. THANKSGIVING IS JUST AROUND THE CORNER AND OTHER HOLIDAY TRAVEL IS COMING SOON. NOW IS A GOOD TIME FOCUS ON WINTER TRAVEL. MAKE CHECKING THE LATEST WEATHER REPORTS PART OF YOUR TRAVEL PLANS SO YOU CAN AVOID STORMS. CARRY A NOAA WEATHER RADIO ALONG TO TUNE INTO LOCAL WEATHER INFORMATION 24 HOURS A DAY. FULLY CHECK AND WINTERIZE YOUR VEHICLE BEFORE THE WINTER SEASON BEGINS. 16. A COMPASS AND ROAD MAPS. KEEP YOUR GAS TANK NEAR FULL TO AVOID ICE IN THE TANK AND FUEL LINES. TRY NOT TO TRAVEL ALONE. LET SOMEONE KNOW YOUR TIMETABLE AND PRIMARY AND ALTERNATE ROUTES. A LAST REMINDER... A WINTER STORM WATCH MEANS THAT WINTER WEATHER IS POSSIBLE... A WINTER STORM WARNING IS WHEN WINTER WEATHER HAS BEGUN OR IS ABOUT TO BEGIN. START YOUR PREPARATIONS NOW FOR THE SAFEST WINTER SEASON POSSIBLE AND STAY TUNED TO THE FORECAST. WE WANT THIS AND ALL WINTER SEASONS TO BE THE SAFEST POSSIBLE. IF YOU HAVE QUESTIONS ABOUT THIS OR ANY WEATHER RELATED QUESTIONS... FEEL FREE TO CONTACT THE NATIONAL WEATHER SERVICE OFFICE IN MEMPHIS OR E-MAIL US AT MEMPHISWEATHER.NET AT WEBMASTER(AT)MEMPHISWEATHER(DOT)NET. TODAYS TOPIC IS FROSTBITE AND HYPOTHERMIA. FROSTBITE CAUSES NUMBNESS AND WHITE OR BLUE TINTED SKIN AND OCCURS MOST COMMONLY IN THE FINGERS... TOES... EARS... AND NOSE. HYPOTHERMIA... AN ABNORMALLY LOW BODY CORE TEMPERATURE... IS CAUSED BY PROLONGED EXPOSURE TO COLD. HYPOTHERMIA CAN OCCUR INDOORS AS WELL AS OUTSIDE. BODY FUNCTIONS SLOW TO A DANGEROUSLY LOW LEVEL. SYMPTOMS INCLUDE SLURRED SPEECH... INCOHERENCE... DROWSINESS... POOR COORDINATION... A SLOW HEART BEAT... UNCONTROLLABLE SHIVERING OR NO SHIVERING AT ALL. TO AVOID HYPOTHERMIA... KEEP YOUR CLOTHES DRY. WET CLOTHING LOSES ALL INSULATING VALUE AND SHOULD BE CHANGED AS QUICKLY AS POSSIBLE. MITTENS AND A WARM HAT ARE NECESSITIES. THE BODY LOSES ABOUT 50 PERCENT OF ITS HEAT THROUGH THE HEAD... SO WHETHER YOU ARE OUTDOORS OR INSIDE AN UNHEATED HOME... DAY OR NIGHT... A HAT WILL GO A LONG WAY IN HELPING YOU STAY WARM. WIND CHILL IS BASED ON THE RATE OF HEAT LOSS FROM EXPOSED SKIN CAUSED BY THE COMBINED EFFECTS OF WIND AND COLD. AS THE WIND INCREASES... HEAT IS CARRIED AWAY FROM THE BODY... DRIVING DOWN THE BODY TEMPERATURE. REMEMBER THAT ANIMALS ARE AFFECTED BY WIND CHILL AS WELL. AVOID OVEREXERTION... SUCH AS SHOVELING HEAVY SNOW OR WALKING IN DEEP SNOW. THE STRAIN FROM THE COLD AND HARD LABOR MAY CAUSE A HEART ATTACK. WEAR LOOSE... LIGHT-WEIGHT... WARM CLOTHING IN SEVERAL LAYERS. TRAPPED AIR IS AN INSULATOR. LAYERS CAN BE REMOVED TO AVOID PERSPIRATION AND SUBSEQUENT CHILL. OUTER GARMENTS SHOULD BE WATER REPELLENT AND HOODED. ALWAYS COVER YOUR HEAD... AS YOU CAN LOSE HALF OF YOUR BODY HEAT THROUGH AN UNCOVERED HEAD. BE PREPARED FOR THE STORM BY LISTENING TO NOAA WEATHER RADIO... COMMERCIAL RADIO OR TELEVISION FOR THE LATEST WINTER STORM ADVISORIES. HERE ARE A FEW TERMS THE NATIONAL WEATHER SERVICE USES WITH WINTER WEATHER. A WINTER STORM WATCH MEANS THAT DANGEROUS WINTER WEATHER IS POSSIBLE AND YOU NEED TO BE ALERT TO CHANGING WEATHER CONDITIONS AND AVOID UNNECESSARY TRAVEL. A WINTER STORM WARNING MEANS SEVERE WINTER WEATHER HAS BEGUN OR ARE ABOUT TO BEGIN IN YOUR AREA. STAY INDOORS DURING THE STORM. IF YOU MUST GO OUTDOORS... SEVERAL LAYERS OF LIGHTWEIGHT CLOTHING WILL KEEP YOU WARMER THAN A SINGLE HEAVY COAT. WEARING GLOVES AND A HAT WILL PREVENT LOSS OF BODY HEAT. COVER YOUR MOUTH TO PROTECT YOUR LUNGS. UNDERSTAND THE HAZARDS OF WINDCHILL. WALK CAREFULLY ON SNOWY... ICY SIDEWALKS. THE NATIONAL WEATHER SERVICE REMINDS YOU TO BE PREPARED BEFORE WINTER STORMS STRIKE. HAVE EXTRA BATTERIES FOR FLASHLIGHTS... FOOD AND WATER... EXTRA MEDICATION... FIRST-AID SUPPLIES... AND BLANKETS FOR ADDITIONAL WARMTH AVAILABLE IN CASE OF EMERGENCIES. BE READY FOR WINTER STORMS BY LISTENING TO NOAA WEATHER RADIO OR YOUR LOCAL NEWS STATION. DURING WINTER STORM EMERGENCIES... STAY TUNED TO NOAA WEATHER RADIO FOR INFORMATION AND EMERGENCY INSTRUCTIONS. POST EMERGENCY TELEPHONE NUMBERS BY THE PHONE AND KEEP ENOUGH SUPPLIES IN YOUR HOME TO MEET YOUR NEEDS FOR AT LEAST THREE DAYS. PREPARE FOR WINTER WEATHER BEFORE IT ARRIVES. 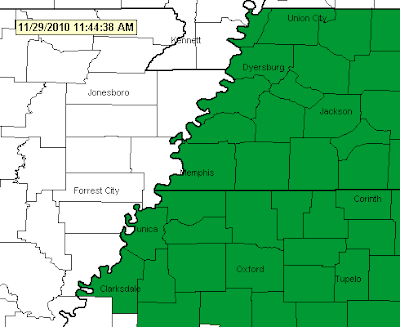 The Mid-South is in the midst of a fairly active period weather-wise. Strengthening low pressure that originated in the western Gulf of Mexico yesterday is moving just to the east of the metro area this morning and will quickly depart the area by this evening, taking the rain and clouds with it. Another low pressure system diving out of the northern Rockies will pass by to our north Wednesday evening. Between these systems, a breezy but warmer day is expected Wednesday. With the passage of the Wednesday evening cold front, a few light showers could develop, but most areas will likely just see clouds from late afternoon through late evening. Cool air of Pacific origin will keep temperatures on Thursday cool once again. Beginning Friday, another period of pleasantly warm weather begins as high pressure builds over the southeastern U.S. Southwesterly wind will help temperatures warm into the 60s Saturday and near 70 Sunday, making for a very nice weekend! This pattern will continue into early next week. Currently, long-range models are indicating that this nice weather will come to an abrupt end around Thanksgiving Day as a strong cold front moves through, bringing much cooler temperatures (more typical of late November) and a decent shot at rain. This is still beyond the range of the MWN Extended Forecast, so we'll continue to monitor. 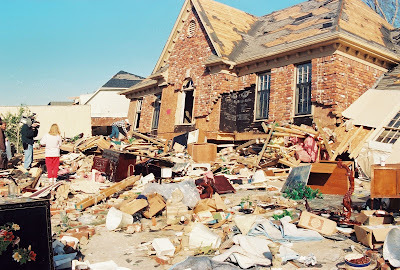 Given the time of year, it's definitely reasonable though that the 70 degree weather will not last forever - it's just a matter of exactly when and how hard it comes crashing down! 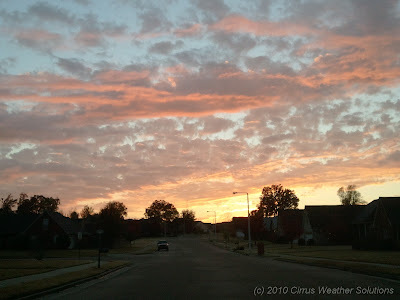 A brief post to share some sunset photos I took around 5:00 this evening. A welcome rain brought roughly a quarter-inch of precipitation to the region this morning with cloudy skies behind the cold front this afternoon. Temperatures fell from near 60 this morning to near 50 by late in the afternoon. 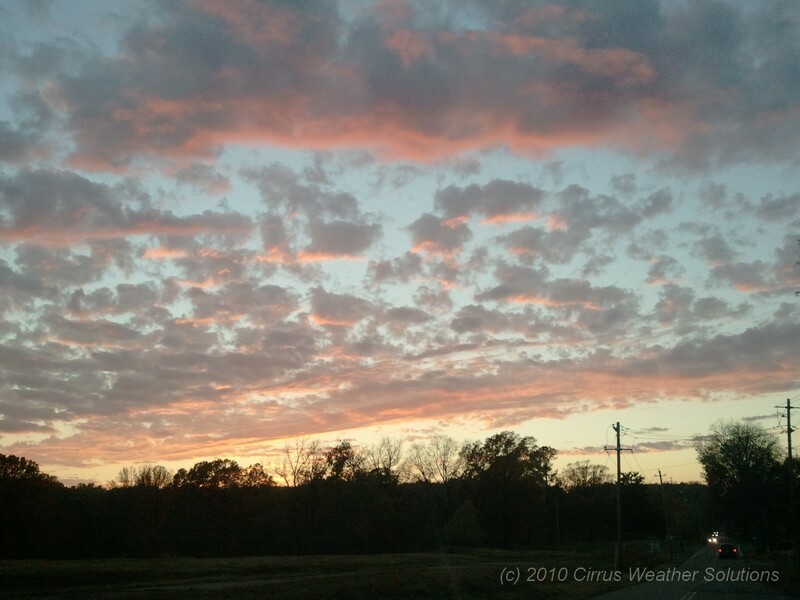 Clouds began clearing out just in time for a gorgeous sunset. I found myself gazing at the sky this morning, taking particular notice of the contrails that marked the lanes of mid-air expressways used by commercial jetliners as they criss-cross the countryside. Above is a picture I snapped from the area near Memphis International Airport at about 8:30am. 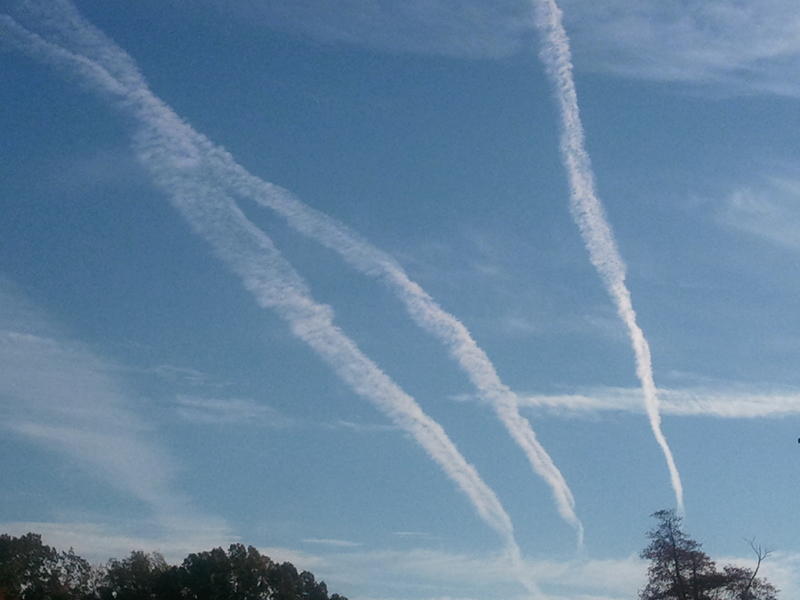 The contrails were aligned generally east-southeast to west-northwest, or along a "highway in the sky" that connects Memphis to Atlanta. I decided this might be a good opportunity to provide a little background on what contrails are and how they form and dissipate, since weather plays an important role in these processes. Contrails, short for "condensation trails," are trails of millions of tiny ice crystals formed by the exhaust of jet engines mounted on aircraft. When the hot and humid air from a jet engine mixes with surrounding air that is much colder and of lower pressure, the exhaust forces the humidity of that air to rise and condense, similar to the way clouds form. It is similar to the process that causes one to "see their breath" on very cold days. At very cold temperatures, a trigger is required for condensation to take place and exhaust particles serve as that triggering mechanism (ice nuclei), forming artificial clouds of condensed water vapor. Also at very cold temperatures, the water vapor that is created rapidly freezes, creating the ice crystals that are visible as contrails. It is interesting that contrails will generally only form above about 26,000 feet (almost 5 miles - an altitude at which most commercial jets traveling an hour or more to their destination easily reach) and when the air temperature drops to -40 F (also, -40 C) [CIMSS, UW-Madison]. At the time of the picture above, the temperature was -40F at an altitude of approximately 32,000 feet (6 miles) over Memphis, so the contrails above were created by aircraft flying at or above that level. As for dissipation, contrails can last anywhere from just a few seconds to hours and can remain as narrow as a 6-mile high tightrope or spread out to become a blanket of cirrus clouds covering a large area. 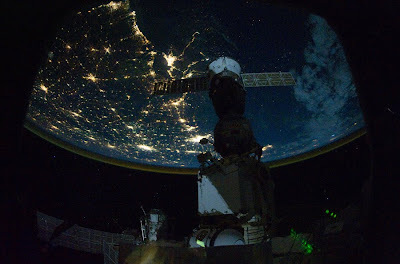 How long they last and whether they spread out or distort in shape depends on the humidity of the air they reside in and the wind direction and speed at the level of the jetliner producing them. The drier the air is at the level contrails are created, the shorter their duration. Drier, less humid air tends to "absorb" the humid contrail more quickly than humid air as it mixes with the drier environment, thus dissipating more quickly. In very dry air, the contrail may disappear just after being created. If the air is moist and the contrail remains in the sky for a long period of time, then the wind has an opportunity to act on the contrail. If the wind at that level is calm, the contrail remains intact or drifts slowly without spreading. If the wind is blowing strongly, which is more typical at 30-35,000 feet, than the contrail will move more quickly in the direction the wind is blowing and likely spread out and become diffuse as it forms an artificial cirrus canopy. Changes in wind speed (turbulence) can be noted if the contrail snakes across the sky. Check out the picture below, courtesy of NASA, of a satellite picture of contrails traversing the southeastern U.S. during ideal conditions. It's pretty easy to tell from this image where the higher moisture resides at the upper levels of the atmosphere. 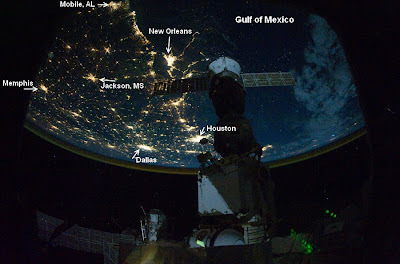 It's not that there are no planes over northern South Carolina/Georgia or Tennessee, the air is simply drier and they have dissipated. The presence of cirrus clouds (very thin light grey in the areas where contrails exist) also indicates upper-level moisture. This would explain why many times contrails tend to last longer when there are also cirrus clouds in the area. 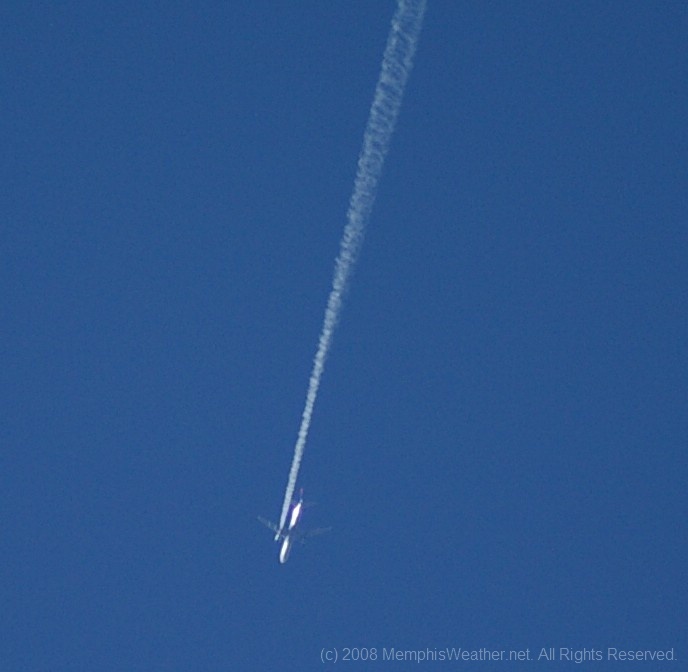 Crystal clear skies tend to not support long contrails as the air is typically drier. The contrail topic is timely due to a recent "mystery contrail" off the coast of Los Angeles (see still image from video below) that is now being hypothesized to be that of a commercial jet. 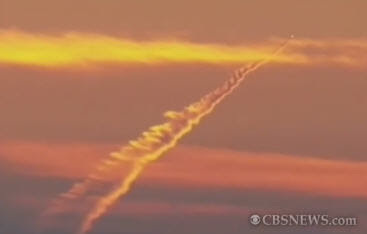 I'm not certain at this point, but it definitely is some sort of vapor trail (video of the contrail from KCBS in L.A.). 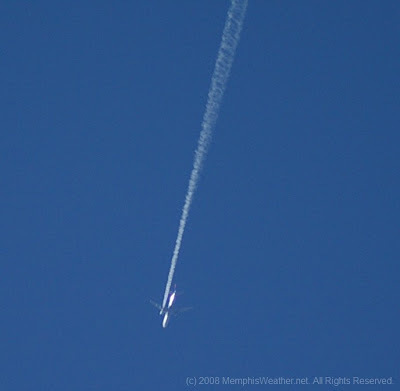 The video at first appears to show a missile, rocket, or other projectile traveling up and away from the camera angle, however an excellent write-up, with many similar examples, on ContrailScience.com tends to support the jet contrail hypothesis - specifically that of America West flight 808 from Honolulu to Phoenix, which would have been traveling inbound to the L.A. Basin. End of the growing season; pleasant weather won't last long! Our recent bout of cold weather has ended and high pressure positioned just to our east is allowing warmer air from the south to blanket the region this week. We will enjoy afternoon temperatures in the 70s through Friday with a few clouds but no rain. Overnight lows are also moderating, from the sub-freezing mark over the weekend back into the 40s and some lower 50s by tomorrow morning. More details can be found in the MWN Forecast. The very cold morning lows over the weekend officially brought an end to the growing season - a term more familiar to those in agriculture than the general public. It is still a useful way to gauge the length of the "warm" season though. The growing season is defined as the period between the last spring freeze and the first fall freeze. 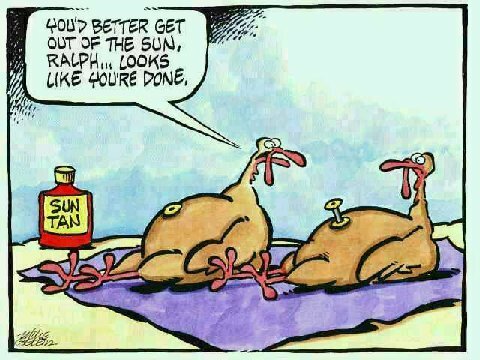 This year, the last 32-degree reading in the spring (at Memphis International) was March 5 and we hit 32 for the first time this fall on Saturday morning, November 6 (a few days earlier than average). Thus, the growing season was 245 days long, or 13 days longer than the climatological average. If you are a farmer, that is good news, though I am pretty sure the flooding in April/May, late summer drought, and extreme heat of the summer probably did more to harm the crops than a little longer growing season might have helped! Looking ahead, the overall weather pattern changes again this weekend and we say good-bye to the 70s for a while. A fairly strong cold front will move through on Saturday, dropping highs by 15 degrees or so and ushering in a decent chance of rain Saturday. After Saturday, the computer models diverge and the solution is not as clear, but what is known is that there will be more clouds and possibly rain chances heading into next week and temperatures will be much cooler for the week before Thanksgiving. The NWS is expecting the same thing - take a look at the 8-14 day temperature outlook below! It appears temps across much of the continental U.S. will be well below normal and there is a 60%+ chance that temperatures in the Mid-South will average below normal for the week of Nov. 16-22. Enjoy the warmer weather this week while you have it! 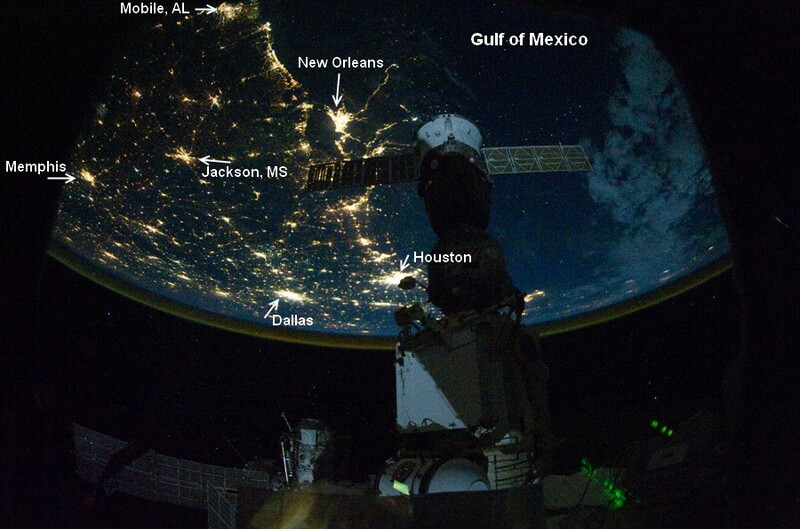 For more information on the photo, click this link from NASA. With a couple of days of cool and damp weather nearly behind us and our first blast of cold late autumn-like air just around the corner, it is definitely feeling like fall! I don't think too many people are complaining about the recent rain considering the lack of it the past couple of months. It has kept temperatures cool and, honestly, was pretty poorly forecast by the computer models until it was already here. The clouds clear out this evening as the upper-level low pressure system responsible for the rain moves farther south into the Gulf of Mexico and a huge upper-level trough dives south towards the region from the north. This trough will settle in Thursday and Friday before moving east this weekend (see computer model graphic above with the trough [red line] positioned just to our east on Friday morning). A trough in the upper levels this time of year means only one thing = much cooler weather! Consequently, I expect high temps to struggle to reach 60 on Thursday and remain in the lower half of the 50s on Friday. While 30s are expected across the region Friday morning, Friday night's low will likely be the coldest yet this fall with nearly everyone dropping below freezing. I am forecasting 35 at the airport and in downtown Memphis and 29-32 in the suburbs (perhaps 26-27 in low-lying colder rural areas). A warm-up begins this weekend as high pressure moves east and brings southerly wind back. Temps should rebound into the 60s by Sunday and near 70 next week. 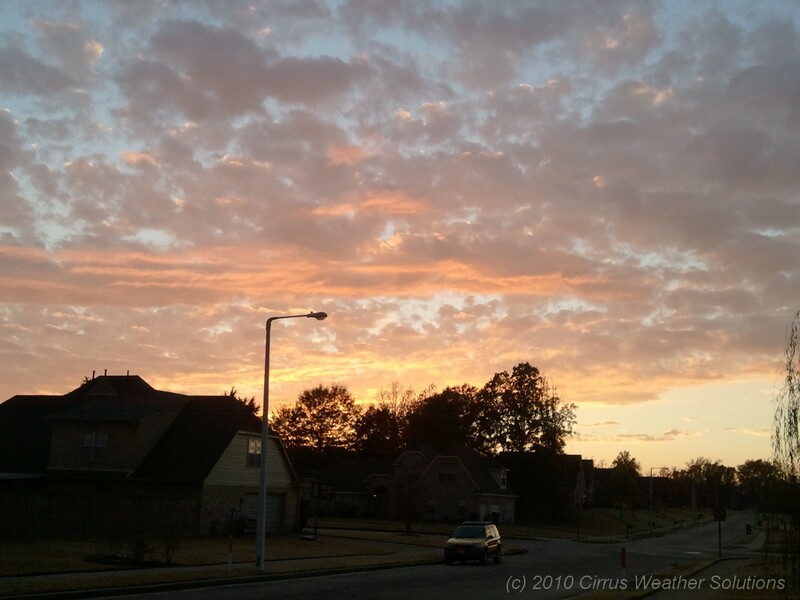 No rain is in the forecast after this evening for the next 5-6 days. Visit the MemphisWeather.net forecast for complete details. October is generally a very pleasant weather month in the Mid-South, with moderating temperatures and dry conditions for the most part. While the dry weather of previous months continued, temperatures averaged above normal as well, with two temperature records being set or tied. 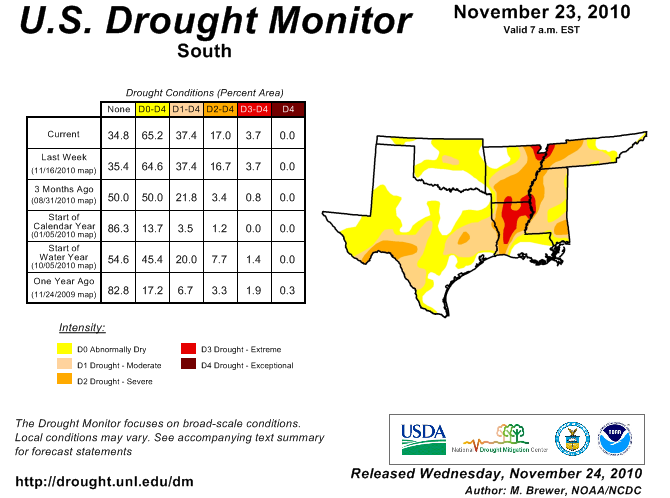 The very dry conditions resulted in the metro area being classified as being in a "severe drought" at the end of the month. For the month, the average temperature was 66.1 degrees, which was 2.3 degrees above normal. The average high temperature was 79.1 degrees and the average low was 53.1, with 2 days reaching a high of 90 and 91 - both of which tied or set record highs for the date (9th and 10th, respectively). The minimum low temperature for the month was 38 degrees on the 30th. Precipitation for the month of October totaled 2.04", or 1.27" below the normal of 3.31". There were just 3 days with measurable rainfall though, as the maximum one day total was 1.65", or over 80% of the month's total. There was one day in which thunder was recorded (24th). The peak wind gust was 48 mph on the 25th, while the average wind speed for the month was 5.6 mph. Click here for a daily statistical recap for October. Bartlett also saw a very warm and dry month. The average temperature for October at the WXLIVE! station in north Bartlett was 61.6 degrees with a maximum of 92.9 on the 10th and a minimum of 29.3 degrees on the 30th. October precipitation ended up well below normal with a precipitation total of 1.73" and only 5 days of measurable rainfall. 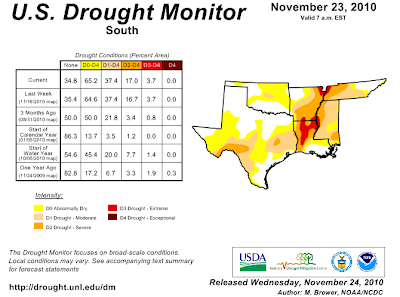 A co-located manual gauge used for the CoCoRaHS program measured 1.75" in October. The peak wind gust was 34 mph on the 26th. Average relative humidity was 60%. Click here for a daily statistical recap on MemphisWeather.net. For the month of October, the average temperature error in all MWN temperature forecasts was only 2.41 degrees, besting all compared computer models, including the National Weather Service, by 6% or more. Over 60% of the MWN temperature forecasts for the month were within 2 degrees of the actual temperature. MWN's forecasts extend out five periods (or 2.5 days). For dewpoint accuracy, the MWN forecast was the second best of the data sources at 3.06 degrees average error and was within 2 degrees of the actual dewpoint over 50% of the time. More detailed accuracy statistics can be found here.